A serious effort to create trust between India and Pakistan seems to have been made in New York. One full hour of conversation behind closed doors without the aid of interpreters or the distractions of a pungent curry meal would have left more than adequate time for a purposive full-bodied discussion in New York on Sunday between the prime ministers of India and Pakistan, Manmohan Singh and Nawaz Sharif. And yet if the outcome of the meeting may look meagre – a seemingly innocuous agreement that the military officials of the two countries would find a means to restore the 2003 ceasefire across the border and the Line of Control – that’s because the optics are almost always deceptive in the India-Pakistan talks. It stands to reason that given the surcharged political climate in India with a rabble-rousing opposition party witch hunting Manmohan Singh for every breath he takes, every move he makes – be it on domestic or foreign and security policies – there was a definite need to keep the real drift of the meeting in New York under wraps. Most certainly, what one can glean from the remarks by External Affairs Minister Salman Khurshid (who was present at the meeting) is that the talks were rather more substantive than what may appear. Khurshid repeatedly spoke of New Delhi’s compulsion to “trust but verify.” A serious effort to create trust between the two countries seems to have been made in New York. Where it leads to, time only can tell because the leaderships in both New Delhi and Islamabad have to navigate around dangerous snake pits on the path ahead, although there is a qualitative difference – the incumbent government in India faces the challenge of seeking a fresh mandate in the elections in early 2014 while Sharif’s leadership is showing signs of consolidating the grip on power. The main criticism of India’s opposition party Bharatiya Janata Party [BJP] has been that the government has not been effective in countering the threat of terrorism originating from Pakistan. The head of the BJP Rajnath Singh even demanded that this was not the appropriate time for Manmohan Singh to engage Sharif in talks. There is an element of one-upmanship here because electoral politics in India has become a vicious zero-sum game. At the end of the day, however, stepping aside the vitriolic polemic, Manmohan Sigh quietly but categorically dismissed the BJP demand and went ahead for the talks. Of course, he took care to underscore that cross-border terrorism will be the main talking point in his conversation with Sharif. In the event, he seems to have forcefully made the point in a “free, frank and friendly discussion” with Sharif that the “bacteria” of anti-India terrorism rooted in Pakistan must be eliminated whether it is “state-sponsored, state-controlled, state-mandated or state-encouraged” – to use Khurshid’s words. In the run-up to the meeting in New York, Manmohan Singh had publicly described Pakistan as the “epicentre” of terrorism in the region. The cutting remark was made in the presence of no one other than the US president Barack Obama. However, a stunning thing happened – Sharif didn’t think it necessary to join issue with what was most certainly an extraordinary outburst by the Indian prime minister. It’s indeed an exceptional happening that the Pakistani leadership conducted itself with a full understanding of the compulsions of India’s electoral politics working on Manmohan Singh’s reflexes. These positive signs and the near total absence of grandstanding by the Indian and Pakistani officials who briefed the media after the talks in New York would reinforce the impression that the talks were actually more substantive and productive than what meets the eye. Significantly, there is going to be swift follow-up within this week itself on the decision to have the meeting of military officials to work out the modalities of ensuring that there are no more ceasefire violations on the border. A meeting at the level of the Director General of Military Operations [DGMO] of the two countries is expected to take place in a couple of days. Again, Sharif seems to have pledged to ensure that the trial on the terrorist attacks in Mumbai in 2008 should commence soon. 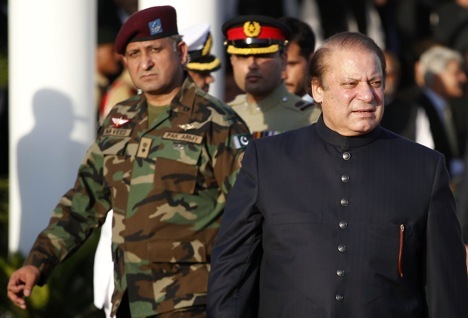 Sharif suggested to Singh various alternatives to meet the Indian concerns over border violations. His original preference was apparently for establishing a committee comprising the two foreign secretaries to be set up to address the border violations. But Singh put forward his own view, which was that the mechanism should be at the level of the DGMO. Sharif readily accepted. Conceivably, Delhi wants the Pakistani military to be a stakeholder at the operative level and be made accountable for maintaining peace and tranquillity on the border. And Sharif saw no problem with that. Reduction of arms in South Asia: A role for Russia? In essence, the two leaderships seem to have a convergence that the tensions need to be kept under check so that the temperatures remain at “the right level for the sapling of the bilateral relationship,” as Khurshid put it. Delhi’s position is that the dialogue process has been suspended due to the force of circumstances, but not destroyed, and can be resumed after “looking at how much success we can get on the ground in terms of peace and tranquillity and what reports we get from the DGMO.” Khurshid summed up that although the dialogue process is at a standstill, “a lot of other things” are happening. To be sure, India and Pakistan have taken a potentially significant step forward to jointly curb violent incidents across the border, which has lately vitiated the climate of relations. A long journey lies ahead for jointly clamping down on cross-border terrorism and it will be a very difficult journey, but the important thing is that there is at least an agreed sense of the overall direction. Of course, the New York meeting was not the forum to conclude treaties on “doable” issues in the India-Pakistan relationship. That’ll have to wait a visit by the Indian prime minister to Pakistan. If peace and tranquillity holds in the border in the crucial months ahead, a visit by Manmohan Singh to Pakistan ahead of the 2014 parliamentary poll cannot be ruled out. Singh is a tough political personality who does not lack the grit to push the caravan along down the difficult road ahead, while the detractors are galore. The New York talks underscored without doubt Sharif’s manifest desire to move forward in relations with India, which in turn has encouraged Manmohan Singh to place trust in him. It’s a dangerous gamble for Manmohan Singh in a crucial election year in India but the chances are that he may pull it off.